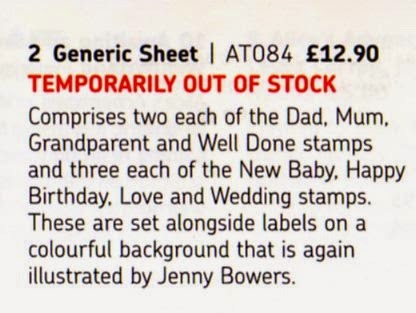 We have now been told what will be available at Spring Stampex, in London from 18-21 February. The Stampex overprint ‘ Spring Stampex February 2015’, which was originally scheduled to be applied to the Machin Post & Go stamp will now be switched to the Union Flag design. Until the machines are loaded, and replenished nobody will be able to say what date codes will be on the Machin and Flag stamps. But it didn't - the Union Flag had the Stampex inscription and the Guernsey Flag stamps were plain - although stamps from B002 were available at the Guernsey Post stand WITH the inscription - see full report. 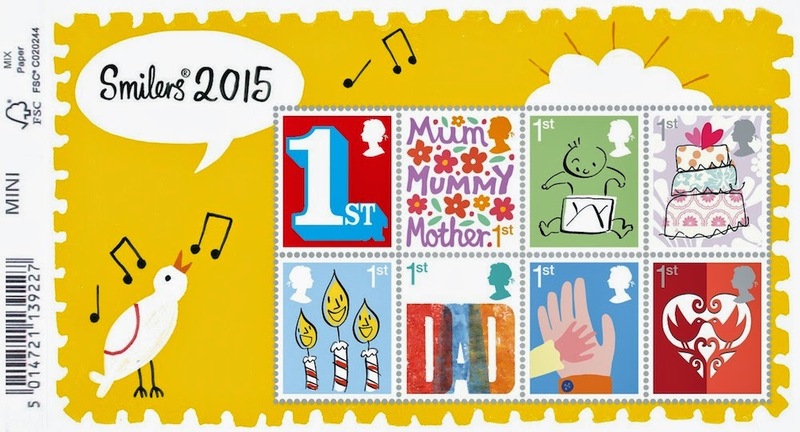 Post Office Rifles on 2015's first Commemorative Stamp Sheet. 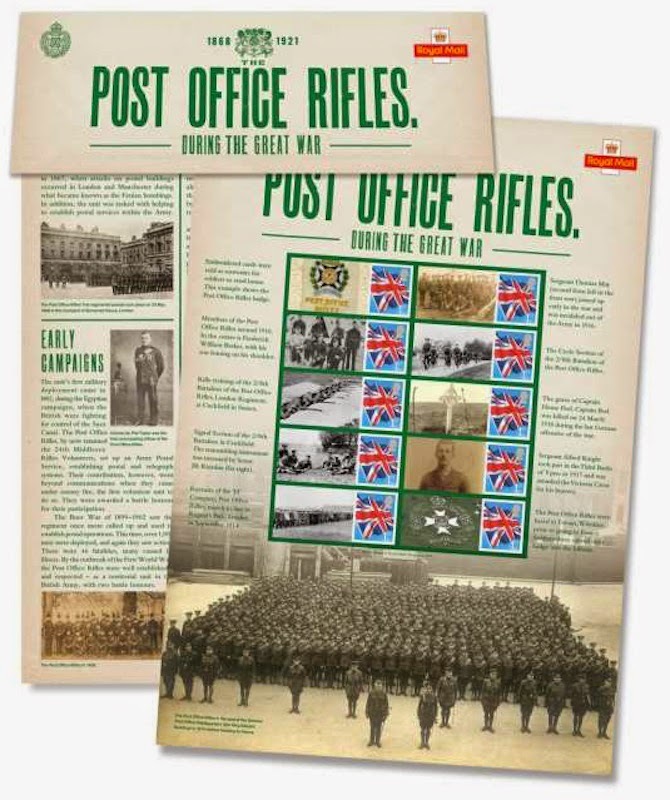 The first premium-priced Commemorative Sheet of 2015 commemorates the Post Office Rifles on the centenary of their arrival in France on 18th March 1915. Royal Mail will sell it for £14.95. It documents their bravery, tenacity and character during their time in the trenches on the Western Front which earned the regiment high praise and a prestigious place in British military history. 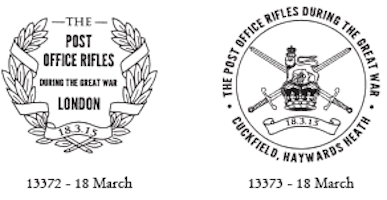 Each sheet is complemented by a backing card telling the story of the Rifles from formation and early campaigns through to their involvement as infantry in the First World War. It also contains a reproduction of the regimental recruitment poster from May 1915. 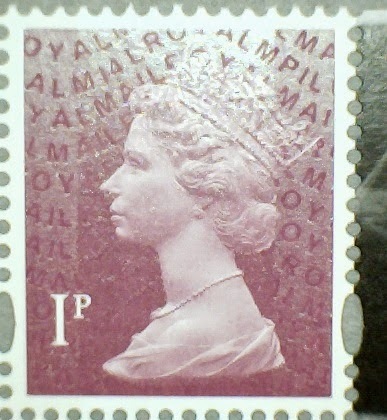 As with the 2014 Locomotives of the United Kingdom prestige book, which had 2013 year coding on the Machins, the first PSB this year - Inventive Britain - has stamps coded M14L MPIL. It's not issued until 19 February, but we know that there are four new stamps, being the 1p, 2p, 81p and 97p on gummed paper, litho by International Security Printers. Unfortunately the selection of stamps once again means only one set per book, so dealers and collectors wanting singles are likely to be using the remainder for postage, so look out for them. UPDATE 4 Feb: Now that we have stock I can show the microscope pictures - more will be on our website later this week. 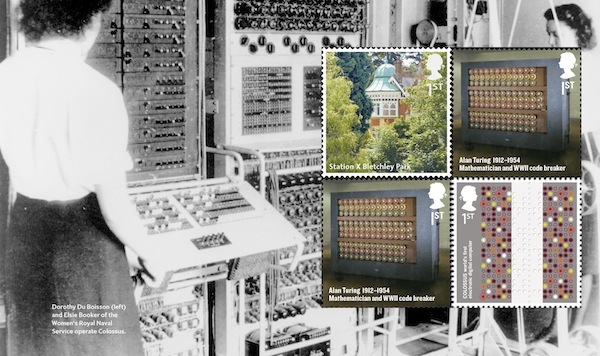 There appears to be no noticeable difference between the stamps in the book and those in sheets, including the A-Z of the UK Bletchley Park and the Britons of Distinction Alan Turing. All were litho printed by Cartor, perf 14½. 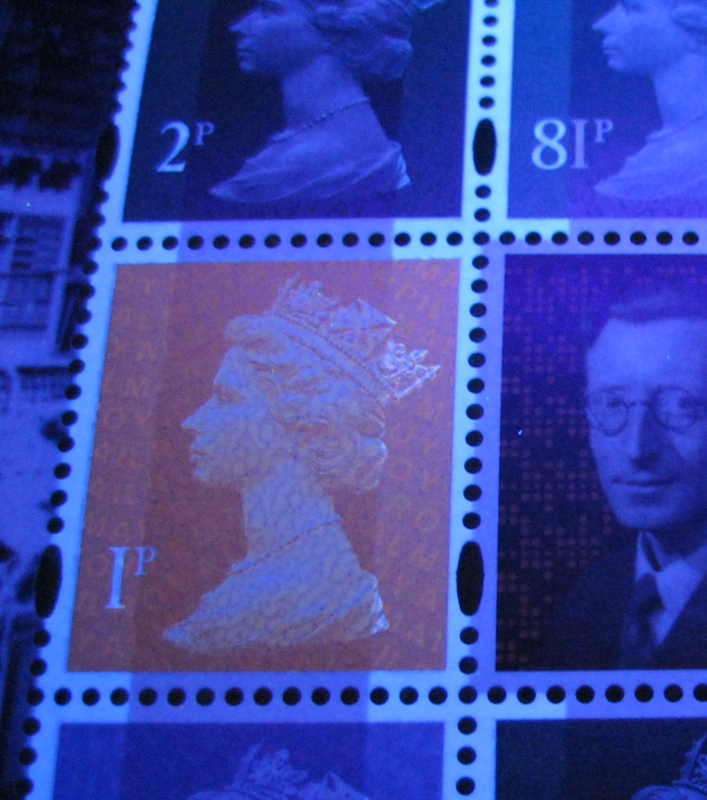 UPDATE: Chris H has sent this UV picture which shows that once again the 1p stamp has an orange glow from the ink. This also happened with the 5p stamps from the First Airmail and Dr Who PSBs and the 1p and 5p from the Football Heroes PSB. UPDATE: Publicity pictures from our website to show what Jonathan is referring to in the comments. Pane 3 with £ missing from the £1.47 ! Pane 4 with £ missing from the £1.28 ! Two unannounced slogan postmarks - but we can prepare for the third! 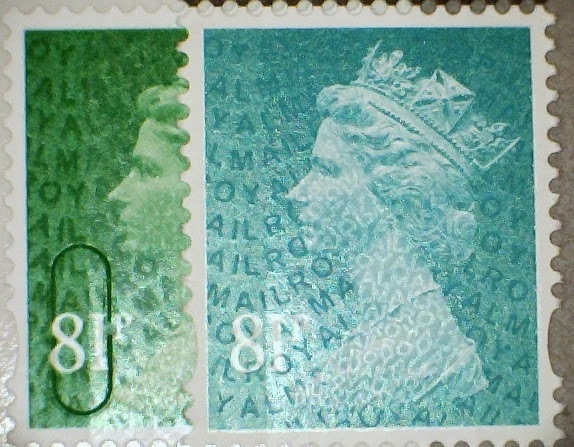 Collectors have reported two slogan postmarks that have not been announced by Royal Mail. 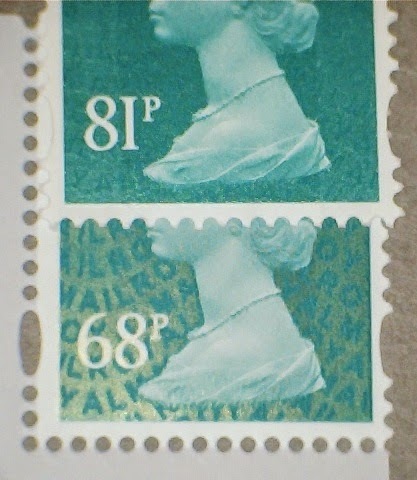 I suspect that these were in use for no more than 2-3 days, so I - and the British Postmark Society - will be interested in better images and reports of usage on any day from any office. 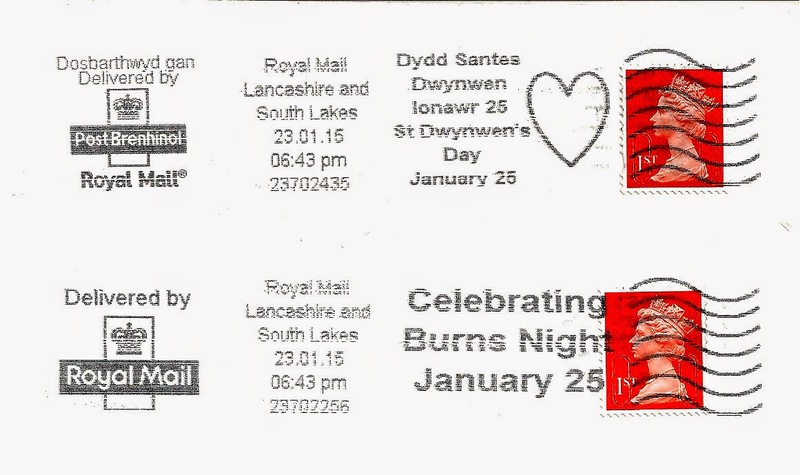 The first reported is from SE Wales Mail Centre on 22 January and celebrates St Dwynwen's Day on 25th. Thanks to Stampboards members for posting these for the British Postmark Database. John E has sent me copies of both slogans on letters posted in the Lancashire and South Lakes MC area. These are both from IMP machine 2 at the same time, demonstrating that the slogan is variable depending on destination. John says "This only applies to IMPs - the iLSMs used by Aberdeen, Edinburgh and Glasgow as well as elsewhere in England, can use only one slogan at a time - hence 'Burns Night' being seen on letters to England." When there's no stamp stock, use something inappropriate! 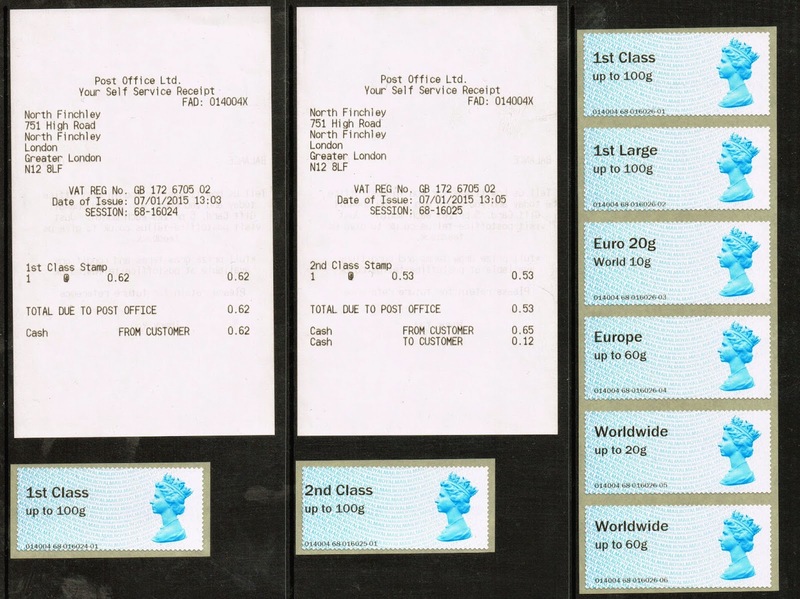 There were several reports before Christmas of post offices with Self-Service Kiosks (NCR) and Post and Go machines (Wincor) using the wrong stamps. It seems like, as with the 97p definitive stamp, branches ran out of stock of Winter Greenery and were forced to use other stock, and that there were many instances of the wrong rolls being inserted into machines. In mid-December we reported that the 1st class stamps were being printed on 2nd class Winter Greenery stock at Perth (and possibly elsewhere) and the Poppy had been used as 2nd class at Norwich. Since then I have been told of Union Flag, Robins, and brown Machins being used for 2nd class rates, and blue Machins being used as 1st class. DP has provided this list which, while not necessarily complete, shows that the problems were widespread. 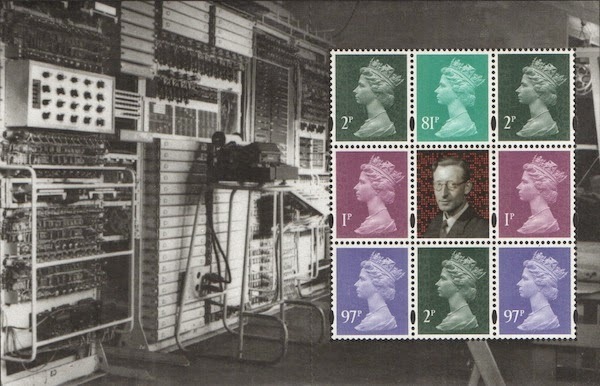 Upper Holloway Post Office is supposed to have a new printing of the 2nd class MA14 with the phosphor band running from top to bottom, as opposed to the split band that has been the norm up to now. Click on these images to see them in a larger size. The next issue of Post and Go stamps will be issued on 18 February, and depict paintings of sailing boats. These will be available from Post Office branches, and at Stampex and other non-postal venues. Most of the branch machines are NCR Self-Service kiosks but some Wincor-Nixdorf Post and Go machines are still operating, and may be supplied with the new stamps. The list in last November's blog is, according to PO Ltd, is still valid although the Wincor machines are due to be decommissioned by 31 March. This sheet is issued today, along with a miniature sheet and retail booklet. Some collectors have got the impression from Tallents House that this is sold out and will not be replaced. A Royal Mail spokesman has told me that the current stocks are indeed exhausted temporarily. It is inconceivable that they would not get more stocks of something that was unavailable for casual sale by phone and from the website shop on the day of issue. When I have more news I will add it here. A collector at our club asked if I could supply one of these which was not supplied to him on his standing order. He showed me this page from Royal Mail's 'Featured' brochure, which was delivered on Saturday 24th. (1) Because there will be space for these in some pre-printed albums, dealer demand would have been higher. Pre-printed albums tend not to have space for the single stamps from, for instance, each new Lunar New Year sheet stamps because the latest one is the same as the first - or at least uses the same basic stamp. (2) I suspect the same reasoning may be behind increased distribution to POs. It is a totally new product and Royal Mail may well have increased the coverage for publicity purposes. The miniature sheet is printed by International Security Printers (Cartor). 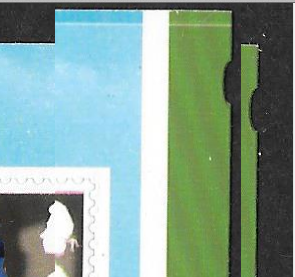 John F has pointed out that all the publicity images, including the one that we have used and the one currently on Royal Mail's website shop show a mock-up of the sheet which seems to be printed by De La Rue, according to the FSC numbers on the margins. The bar-code and short-name are also different. Using library or design-studio images is fine up to a point. That point is reached when you start to sell the stamps, or offer them to others to sell. Of course dealers can scan their own, but when we are provided with 300 dpi images it ought to make sense to use those. Apparently not ! 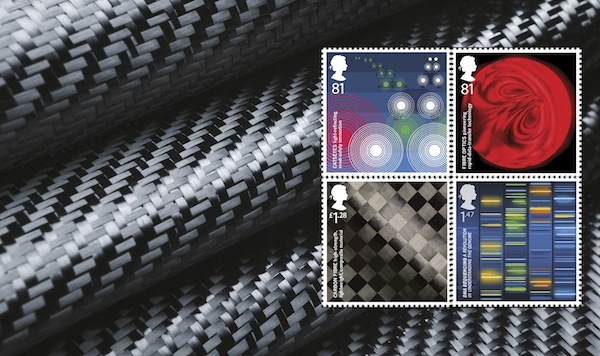 Some more new printings of 2014 definitives have been reported. Please let us know if you would like date blocks of any of these and we will do our best to obtain them. Thanks to an Anonymous poster for bringing this to our attention. As 2014 is no longer news, I'm restricting this report to what they have announced about 2015 Exhibition attendance. Exhibitions may be added or removed and stamp listings for individual shows may change. 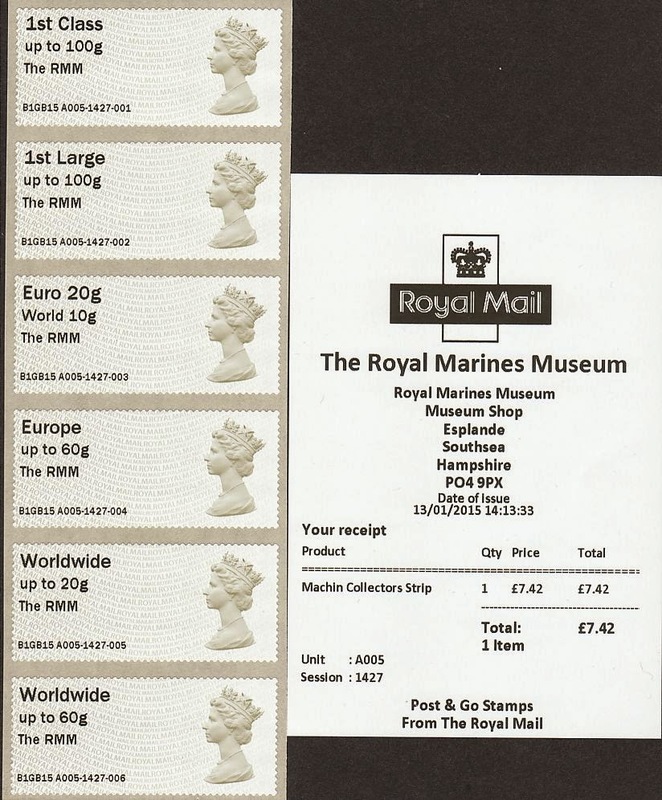 Images of the Royal Marines Museum Faststamps will be added to the original report shortly. Confusion in pre-printed stamp albums - is your collection complete, or only a full album? Once upon a time some of my foreign collection was a preprinted album, but I soon found that it was too restrictive for the 19th century used collection, with all the plate varieties and shades, not to mention nice multiples and fancy postmarks. So I gave it up and reverted to a plain album with quadrille pages. But I know that very many collectors of modern GB and other countries do use these albums, and their collecting is based solely on what is included, and omits what is excluded. Fair enough, it's right that everybody collects what they want to. But if the album is complete but the collection is incomplete in the eyes of the dealer who eventually buys it, it won't realise its full potential. And how do you know what is complete and what is not? A customer recently asked for some stamps for page from his new SG De Luxe supplement, and I was puzzled by what it appeared to have spaces for. 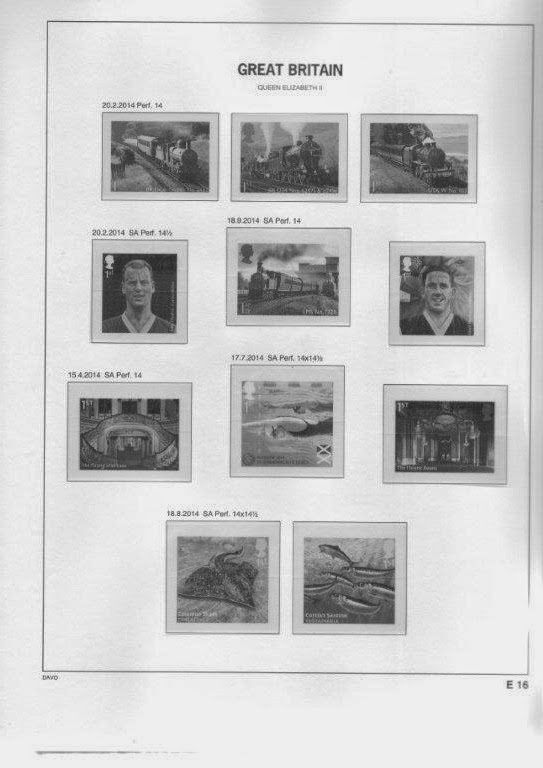 Even at this size (click on the image for a larger version), you can probably make out that all the stamps are from self-adhesive retail booklets: 2 x Sustainable Fish, 2 x Buckingham Palace, 1 x Commonwealth Games, 2 x Football Heroes 2, and .... 4 x Classic Locomotives? I asked for clarification and he sent a list of the stamps with their SG catalogue numbers. The fourth Locomotive is indeed 3634, the Welsh booklet stamp. 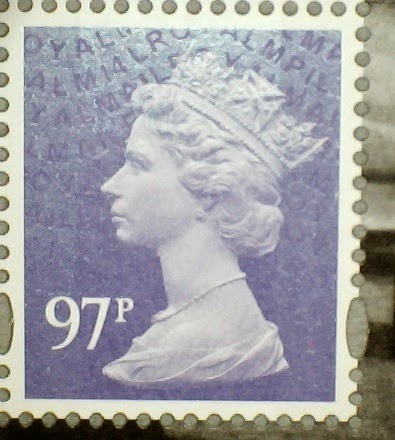 The other three are 3570-72, the England, Scotland, and Northern Ireland gummed stamps from the Classic Locomotives of the United Kingdom prestige stamp book. 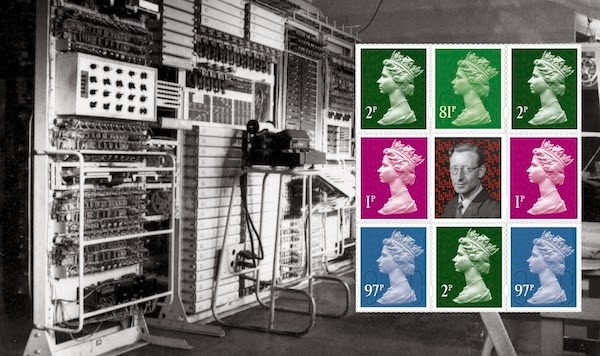 All well and good, but where do you put 3573-77, the other 5 gummed stamps from the PSB? I asked Gibbons, and apparently there is space for those on page 243, presumably just after Working Horses and before Remarkable Lives. This isn't completely Gibbons' fault, the album is actually the Davo album rebadged and with an SG-produced index. The pages don't actually have catalogue numbers on them. My customer had filled page 243 with stamps from the miniature sheets although they are actually the wrong stamps. The MSs were printed by Cartor and the PSB by Enschede. So he's 'wrong', but does it matter? Well, it depends on how detailed you want to be, but it may affect the sales proceeds as I mentioned earlier. It is probable that the buying dealer will assume that the stamps in the spaces for 3573-77 are in fact those stamps - and he will put them into his stock as those stamps, and people will buy them as Enschede printings from the PSB when in fact they are cut-out of the Cartor MS. The stamps are not very different... The Cartor printings have more yellow; the black and white pictures are creamier. Here the PSB stamps are overlayed on the miniature sheet. Note particularly the difference in the background to the Queen's head on the 1st class Scotland. I don't think these shade differences would be expected from a normal print run - the runs are too short anyway - no, these clearly show two different sources and two different printers. Side by side they are different, but on page 243 some way from the actual miniature sheets, who will notice that they are the same, when they should be different? So, what you collect is your choice - we still have a few sets of 8 from the PSB in our webshop. My comments focus on Davo (and hence SG), but what about others, such as Lighthouse? Can album users provide any information on omissions or inconsistencies? When ISP moved to new premises at Wolverhampton they were able to use their new Cerutti press for the Alice in Wonderland retail booklet. Hopefully this will improve quality and reduce the registration errors that have been a feature of booklets over the last few years. However, the early signs are not too good. 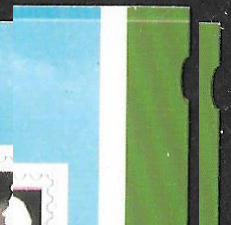 These two booklets were received in Holland from Royal Mail's Edinburgh Bureau, and as well as illustrating a nice miscut, they also pose some questions. As you can see (click on the image to enlarge), the lower (miscut) booklet is missing part of the caption on the leading edge, and the magenta cylinder number is tight up to the edge. Note on top the trimline between books and also the outer ellipse at the right edge which has the same height as normal books. So this must be done after the books are trimmed from the large printing rolls. However, even that situation is not as straightforward as it seems as these pictures show. 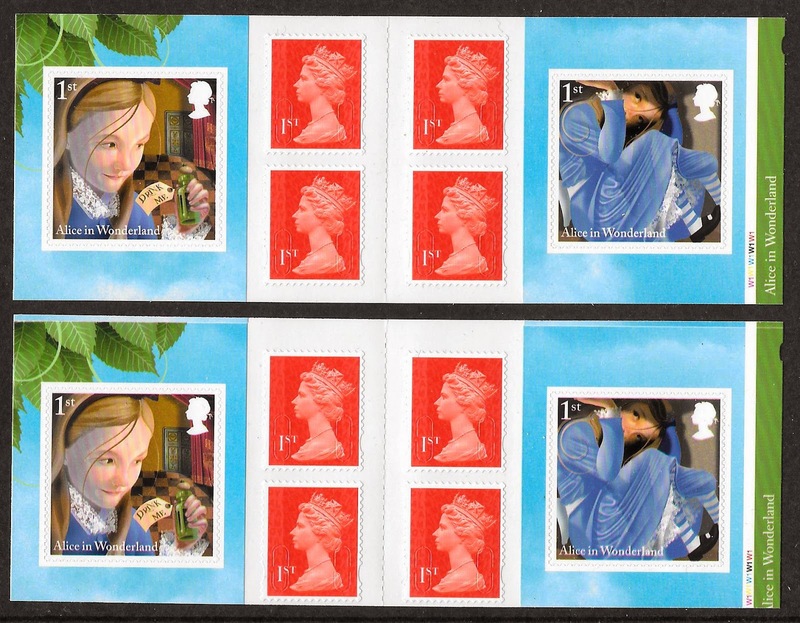 Firstly, the two booklets lined up so that the Alice stamps are in the same place. Then, the booklets lined up as cut - in which the two cut-outs are close to being in the same place. Lastly lined up so that the trim-line is level with the top of the correctly cut booklet. Neither of these shows the cut-out in the same place, which suggests that some of the height is removed in the cutting process. Good luck to ISP, it will be interesting to see how they get on with other similar booklets. I don't think this type of error can be laid at the foot of the Cerutti printing press. The press prints both side of the web in one operation and then rereels it back into a jumbo roll. This is a high speed process. The operational web width is 800mm; with booklets being about 170mm one can get four columns (the Chesnut was two columns). The web isprobably slit into two working rolls on press. These jumbo rolls will thenbe put into store. Subsequently, a working reel will be mounted onto the next machine (a slower speed process) that will do the die cutting; draw off the stamp matrix and then sheet the web into gangs of six or eight. Its only at this point in the production cycle cutting of the web occurs or further on. This part of the operation probably hasn't changed from the old site. The final phase will be to take the gangs and guillotine them into booklet form; fold them and pack them. When the Post and Go machines were affected by the March 2014 tariff change we published (and added to) details of the various sets which had been found around the country. 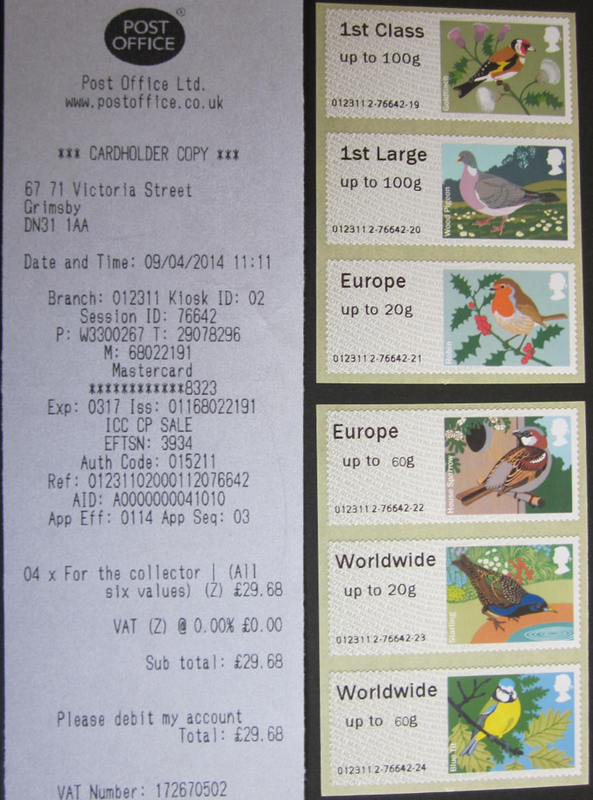 This included Birds 2 at Grimsby, stamps which were bought in early April. At the time, and even last week when our round-up of the year was published, Birds 1 hadn't been found with the 60g values. Issued in September 2010, to only a small number of offices, surely they must all have been used? Well apparently not, as this set was also bought in early April 2014 and is currently available on eBay from seller 12pea. Available for (up to) 30 days - yours for only £1,250. Thanks to the people who told me about this. UPDATE: At the York Stamp Fair I was shown 60g values from Harrogate. The date of production was not available. 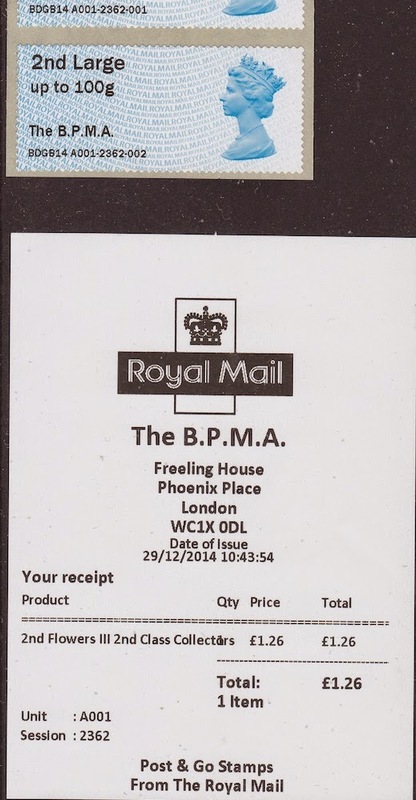 Sadly not on the stamps themselves but on the receipt. This error occurred on 29 December and we think it was probably corrected quite quickly (I haven't seen any on eBay!). The difference to the receipts results from the software change (machine reset) after the Winter Greenery issue was taken off sale. But I notice also poor (or non-)wrapping of the details, on the earlier receipts with the description overrunning the quantity. Thanks to Malcolm for what is probably quite a scarce error - and he didn't notice it until he got home! 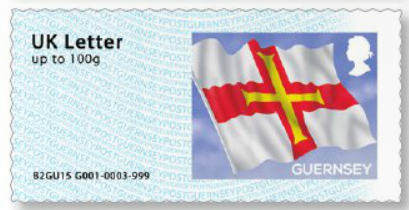 Guernsey Post is delighted to announce that it has joined the Royal Mail Post and Go family, with its first series of Guernsey Post and Go stamps to be released on 18th February 2015 featuring the Guernsey Flag. Guernsey Post is the second postal administration to join Royal Mail Post and Go, which is a new and exciting way to begin or enhance a stamp collection. 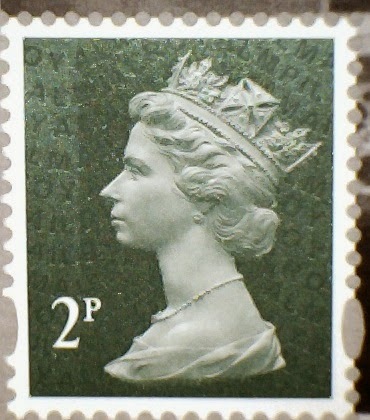 Guernsey Post’s head of philatelic, Dawn Gallienne explained: “Post and Go stamps are overprinted with the postage on demand, each carrying unique identification numbers depending on the machine and session number of where they are issued. 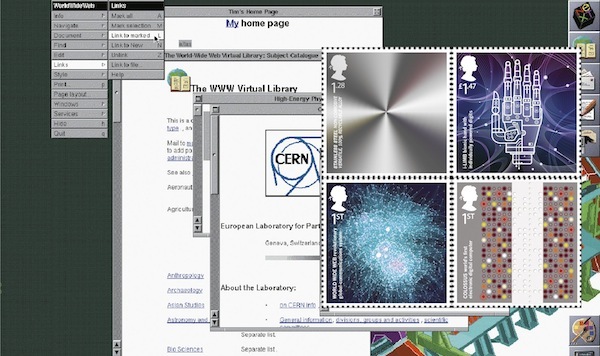 “We are very excited to join the Royal Mail Post and Go family and to offer our customers a new product which complements our existing stamps,” she added. Guernsey’s distinctive red, white and gold flag features the St George’s Cross and incorporates a uniquely shaped gold cross taken from the flag of William the Conqueror. It was adopted by the States of Guernsey on 30 April 1985 and first flown on 9 May 1985 – the 40th anniversary of the island’s Liberation from the Occupation of WWII. 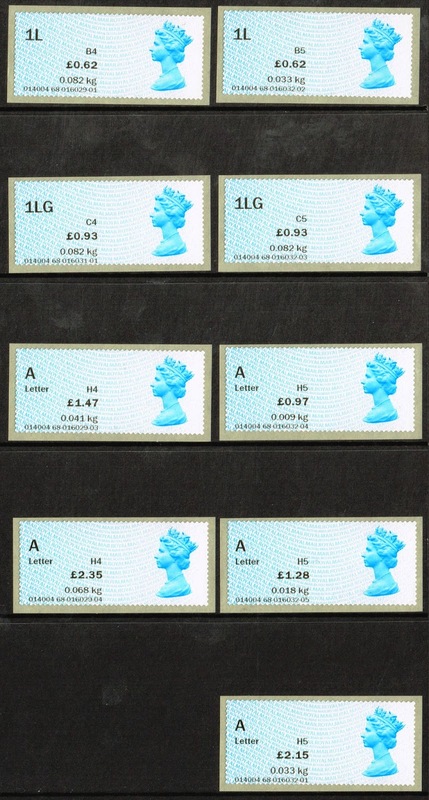 The stamps will be available in values of GY Letter, GY Large Letter, UK Letter, UK Large Letter and International Letter up to 20g, International Letter up to 40g at Stampex. The Guernsey kiosk GG01 GU01 will be to the latest standard, with speakers and side pod enabled. It will be on the Post and Go Stand at Spring Stampex alongside JE01 from Jersey. 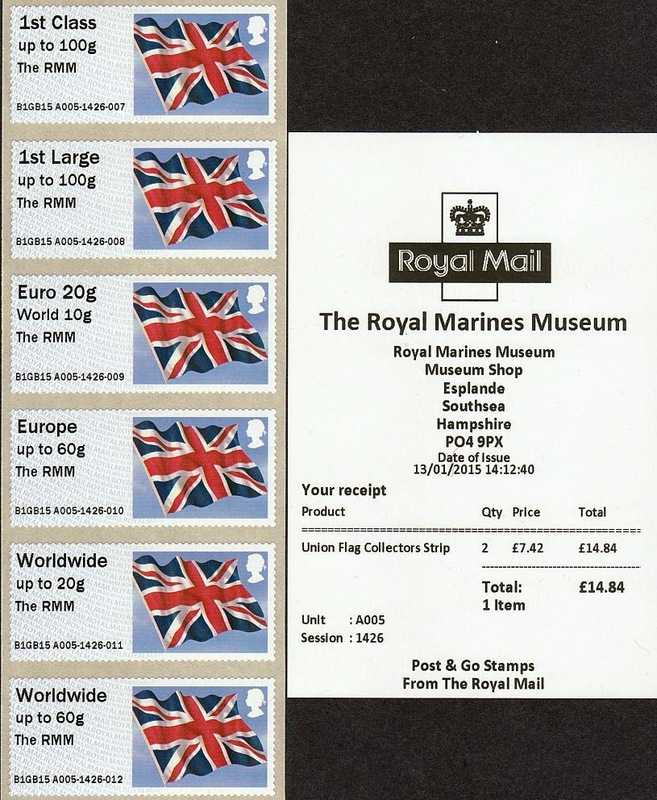 Don't be surprised to see the GG01 GU01 machine at Stampex dispensing Royal Mail Union Flag stamps as JE01 does. Update: I've been advised by IAR that the Guernsey machine will be coded GG01, not GU01. 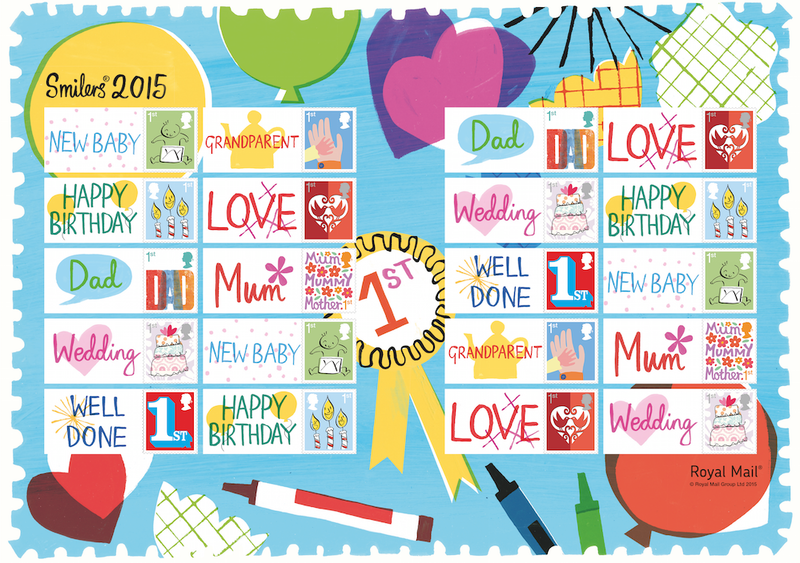 Update 19 January 2015 - a picture of the stamps and FDC is now available on Guernsey's website. 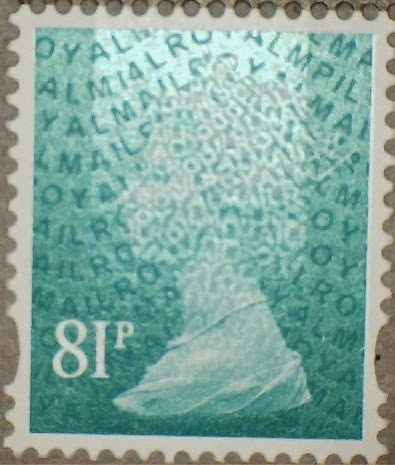 The Stampex inscribed stamps are available from today. The plain stamps will also be available but there will be a delay of about a week. Both these will be supplied in vertical strips of 6 (not as currently shown on their website). 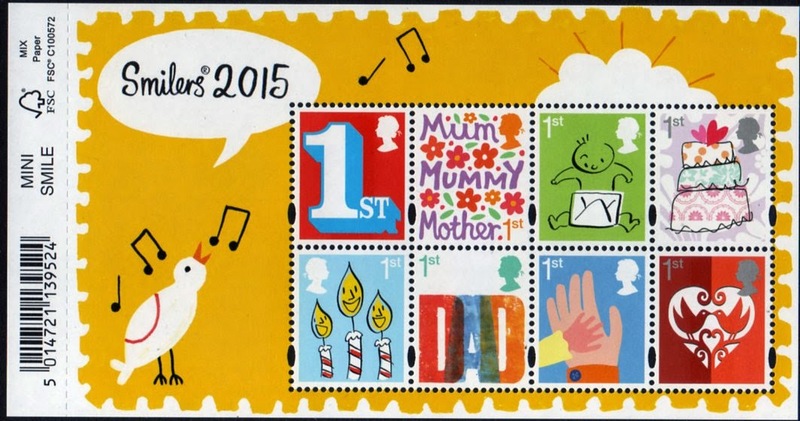 The plain ones are also available in a pack (apparently as 6 loose stamps), and a first day cover. 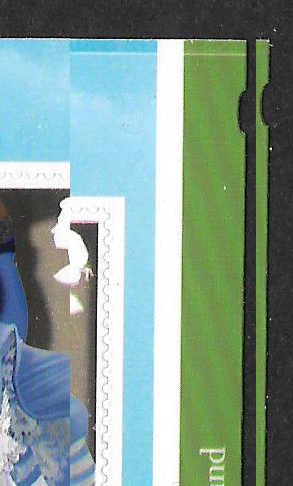 The first Jersey Post and Go overprint of 2015 will be dedicated to Sir Winston Churchill, Jersey Post has revealed. will be available from 24 January 2015 for one month only and the Jersey Philatelic Bureau is recommending collectors order theirs whilst stocks last. The JE02 series Post and Go machine, powered by Royal Mail, is located in Jersey Post’s Broad Street post office in St Helier. Union flag stamps, also available from the machine, will not carry the Churchill overprints but will continue to feature the ‘Broad Street’ location identifier. Meanwhile, Jersey Post’s JE01 machine will remain at Jersey Post Headquarters until the end of January, where it has proved useful for local stamp purchases for Christmas. Stamp labels vended from this machine will still carry the ‘Jersey Post HQ’ location identifier. Post and Go is the next generation of self-adhesive stamps overprinted with the postage on demand. 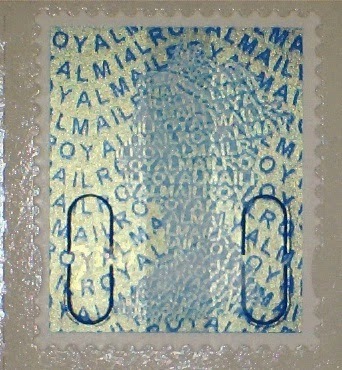 It represents a new and very exciting way to begin or enhance a Jersey stamp collection. Just like Royal Mail Post and Go stamps, Jersey Post and Go stamps carry unique identification numbers depending on the machine and session number of where and when they were issued. 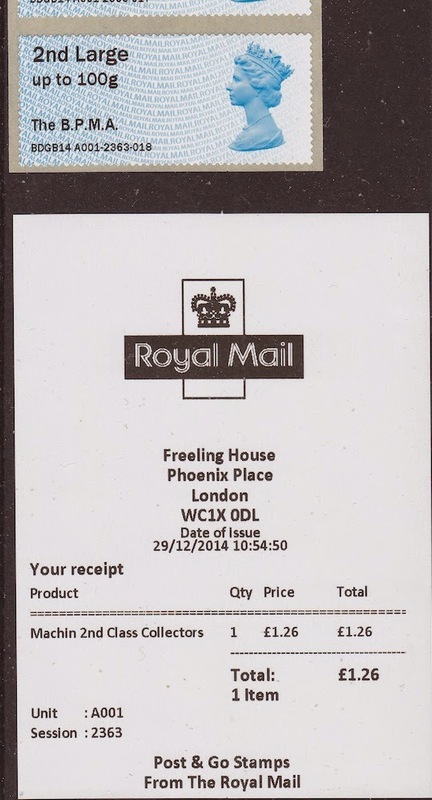 All Jersey Post and Go stamps are supplied with a dedicated receipt. Philatelic stamp products such as the original set bearing the six tariffs, First Day Cover and Presentation Pack can be ordered at: www.jerseystamps.com or by contacting the Jersey Philatelic Bureau on: 00 44 (0)1534 616320. Royal Mail have told us that machine A005, believed to be the former development machine at contractors IAR Bristol, is to be relocated to the Royal Marines Museum in Southsea from 13 January. Thanks to Chris we can now show the output from this machine - Machins are ‘MA13’, Flags undated.